dust and sand falling in the mouth, the eyes. a living body that insists on staying. silent. restless. What is unnoticed? What settles? What does this body hear and renovate into dance in this prison that is now a museum? excavation is a dance installation taking place in the passage between floor 0 and floor -1 of the museum of aljube. an ongoing research, supported by the national centre for culture (young artists grants 2018). sofia ó is a researcher with an internship in creation at the c.e.m – centre in movement. 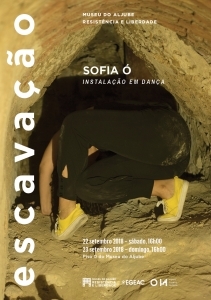 she is a dancer and an anthropologist, the author of teatro de dança galpão: experimentações em dança e práticas de resistência durante a ditadura civil militar no brasil (ed. prismas, 2016) [Galpão Theatre of Dance: dance experimentation in resistance practices during the military dictatorship in Brazil].